All accounts will be payable at the commencement of hosting and thereafter on each yearly anniversary. Apart from exceptions solely at the discretion of Greengraphics, all invoices will be forwarded by email. The Client agrees that from time to time Greengraphics will send electronic and/or physical mailouts to the Client. At any time a Client can cancel their hosting account. Written advice should be provided (by letter or email) to Greengraphics. The cancellation of the account will occur from the time Greengraphics is reasonably able to act after notification is granted (usually same day). Greengraphics will not normally issue a refund for any period already invoiced. By default, Greengraphics will ensure web hosting is ongoing. Therefore the Client should contact Greengraphics before the next billing cycle if they wish to cancel their account, otherwise a new annual invoice will be issued. See automatically renewing your account for more information. The Client agrees to use all Greengraphics services and facilities at its own risk. To the maximum extent permissable by law, Greengraphics specifically disclaims all warranties of merchantability and fitness for a particular purpose. In no event shall Greengraphics be liable for any loss, or loss of data, or other commercial damage, including but not limited to special, incidental, consequential or other damages. The customer agrees that it shall defend, indemnify, save and hold Greengraphics harmless from any and all demands, liabilities, losses, costs and claims, including but not limited to reasonable legal fees asserted against Greengraphics, its agents, its customers, its officers and its employees, that may arise or result from any service provided or performed or agreed to be performed or any product sold by the Client, its agents, its employees or its assigns. Greengraphics takes no responsibility for emails not delivered, sent or received. Greengraphics takes no responsibility for textual or numerical errors, either supplied by the Client, Greengraphics or a third-party. Greengraphics takes no responsibility for copying and pasting details supplied. It is the Client’s responsibility to check their email system and let us know if there is any (perceived or actual) problem identified. Many computer, software and hardware issues need to be attended to by an IT support person rather than a web host. Greengraphics is not an IT firm. We do not come to your premises to help with computer matters. Greengraphics takes a zero tolerance approach to the sending of Unsolicited Commercial Email (UCE) or spam over its network. Very simply this means that Clients of Greengraphics may not use or permit others to use its network to transact in UCE. 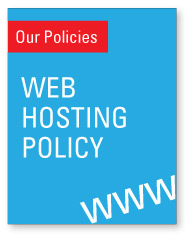 The Client may not host, or permit hosting of, sites or information that is advertised by UCE from other networks. Violations of this policy carry severe penalties, including termination of service. Upon notification of an alleged violation of the spam policy, Greengraphics will initiate an immediate investigation. During the investigation, Greengraphics may restrict the Client’s access to the network to prevent further violations. If the Client is found to be in violation of the spam policy, Greengraphics may, at its sole discretion, restrict, suspend or terminate the Client’s account. Further, Greengraphics reserves the right to pursue civil remedies for any costs associated with the investigation of a substantiated policy violation. Quite simply, to avoid any problems or costs, do not spam from, through, or in connection with your Greengraphics account. Greengraphics is in the business of web hosting – not smtp hosting. It is neither appropriate nor acceptable for our web hosting servers to be used as a point of email origin for anything other than low level mail despatch from web based applications. Such acceptable applications would include general feedback and online order forms. If you have any complaints or comments regarding spam on our network, please direct them to us. All services provided by Greengraphics may be used for lawful purposes only. Transmission, storage, or presentation of any information, data or material in violation of any Australian or USA law is prohibited. This includes, but is not limited to, copyrighted material, trademark, intellectual property, material judged to be threatening or obscene, or material protected by trade secret and other statute without proper authorization. The Client agrees to indemnify and hold harmless Greengraphics from any claims resulting from the use of the service which damages the Client or any other party. Greengraphics will be the sole arbiter in determining violations of this provision. For the benefit of all Clients and to maintain a quality service, Greengraphics reserves the right to suspend any domain without any notice if that domain is found to be using too much of the server’s resources and therefore abusing the server. In such an instance it is the Client’s responsibility to contact Greengraphics to formulate a strategy to allow the domain to be reactivated. Greengraphics and its server manager will be the arbiters in determining violations of this provision. Any script that processes a massive number of flat files or large flat file databases. Any script that requires a “register_globals = on” directive. Any script that facilitates the exploitation of our servers in any way. Any script installed on our servers must at all times be kept up to date by the Client with the latest stable version available from the supplier or developer of the application. In the case of the Client allowing a script with a reported exploit or vulnerability to remain installed on a server, Greengraphics and its server manager reserves the right to disable the script, or terminate the site. Greengraphics and its server manager will be the arbiters in determining violations of this provision. Further to the above, Greengraphics and its server manager reserve the right to disable any script, or terminate any site, which it considers to be affecting normal server operation or service to other Clients, or which represents a general risk to our servers. Greengraphics and its server manager will be the arbiters in determining violations of this provision. In general, full server backups are made and retained on daily, weekly, and monthly cycles. However, absolutely no guarantees are made of any kind, either expressed or implied, as to the integrity of these backups. Backups are made for server restoration purposes only in the case of large scale data loss occurring on a server for any reason including but not limited to hardware failure, software failure, server hacking and general data vandalism. Please take note that it is solely the Client’s responsibility to maintain local copies of its web content and any associated files including but not limited to scripts, data files, databases and other ancillary files. The Client acknowledges and agrees that data may be lost or corrupted in connection with the use of the service and acknowledges that Greengraphics shall have no liability to the Client in the event that any or all data is lost or destroyed. We are here to help you. Please contact us by phone, email or drop in to our office at any time if you have any questions about your website, email accounts, or general questions about the universe. Greengraphics reserves the right to refuse service to anyone for any reason not prohibited by law. Greengraphics reserves the right to terminate service to any Client for any reason not prohibited by law. Greengraphics reserves the right to modify this document and these policies at any time.